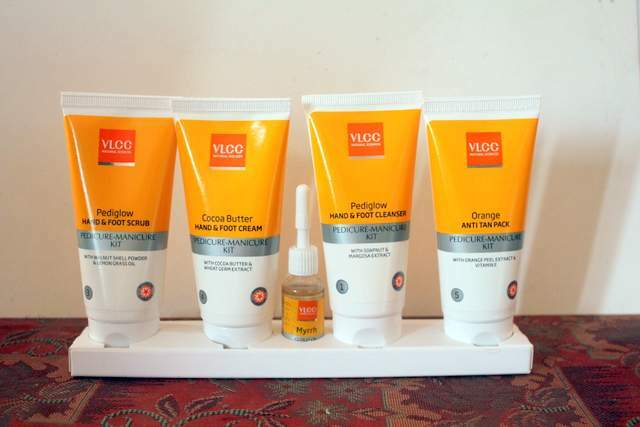 The VLCC Pedicure-Manicure hand and foot care kit gives you beautiful and healthy tips and toes. So here’s what is in the kit! This is a little 10ml bottle that has a unique combination of Myrrh and almond oil that makes the cuticles smooth, supple and wrinkle free. This needs to be massaged into your cuticles for 10-15minutes. This is perfect to remove that dreaded tan form your hands and feet. Enriched with orange peel extract and Vitamin E, it does work on getting red of the tan if used regularly.